Well over on the HECNet mailing list, there has been quite a bit of excitement over the opencores project, that is a PDP11/70 system on a chip. It’ll run on two FPGA eval boards, and can even boot up 2.11 BSD! So I figured I’d get into some of the spirit, and see how far I could get with SIMH. Following the great instructions on vak.ru to get a 2.11 BSD tape installed into SIMH. I then spent some time trying to work out a working Ethernet configuration to at least be able to telnet into the VM… It seems the de driver under the PDP-11 suffers the same problem the VAX 11/780 had regarding something being flagged somewhere with errors. I didn’t ‘fix’ the simulator I took the shortcut, and fixed the driver to ignore all errors on the interface, and now I can telnet into it! I’ve also modified the boot program, and init to auto-boot the kernel, and bring the system up into multi-user automatically. So I just slapped together a zip file, and placed it on my sourceforge page here for downloading. I didn’t do an installer program this time, as I wanted to build some programs to make it more fun, but it seems that the PDP-11 is limited to 64k data/ 64k instructions for executables, so although I’ve compiled ircII, it will not link. I can verify that you can telnet into the VM (localhost 42323), and the pdp11 executable I’ve enclosed includes my SLiRP patches. I guess for the more adventitious, you could extract out the rest of the source, and apply the some 400+ patches to 2.11 BSD and have a current system. But if anyone knows how to build something like IRC on 2.11 BSD give me a shout. 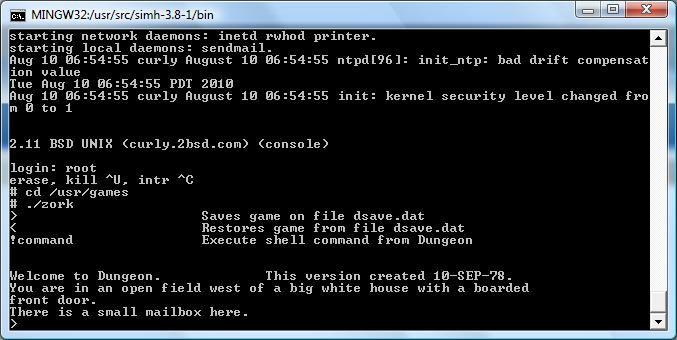 Oh, and much to my surprise, this version includes zork, and it’s the same RT-11/LSI-11 binary that the VAX loaded up in some RT-11 syscall emulator. Steven Schultz has been patching 2.11 BSD for years now, and has over 400 of them…!!!! Yes, it's amazing that 2.11 BSD is essentially supported software. wow. that's awesome. i recently got a Toshiba 300CDT laptop, which, for its age is an neat little machine, and i'm using it to try out ancient OSs (my current project is installing Rhapsody DR2). too bad that there's no i386 port of 2.11BSD. Well the 2.11 BSD stuff is really 4.3 backported… so really what you want is 4.3 BSD for the i386, which basically is 386 BSD…. If you have lots of patience, and a billion floppies you can do it…..
i don't know if this is piracy ot not (personally, i like to think of everything older than 10 years as abandonware), so feel free to yell at me if you think i should shut up, but.. I'm sure I've seen it somewhere… after the end of the CSRG vs ATT lawsuit 32v wasn't encumbered anymore so all of that stuff is 'free'. email me (@gmail.com) and I'll give you a link I found…. About Mr. S. Schultz. Do you maybe know of somewhere he might hang out, next to ClassicCmp?